See more objects with the color tan firebrick gold orangered sandybrown or see all the colors for this object. This is a Extension Cord. It was invented by Jake Zien, Jacob Bonaire, Sonia Covarrubias-Garcia, Spike Mendelsohn, Jacob Riesgaard, Richard Moreen and Charlie Dougiello and designed by Quirky and manufactured by Quirky. It is dated 2013. Its medium is plastic, electrical components. Riesgaard was annoyed with having to climb up and down his ladder to unplug various tools while working on projects in his garage. 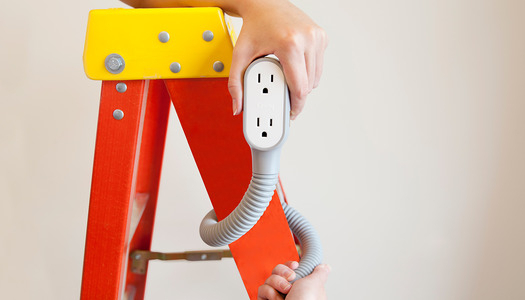 He approached Quirky with an idea for a cord that could wrap around the leg of a chair or the side of a ladder.